NGS: Ch4 – A Mother’s Love | SHANNARO!!! I want to apologize from the delay. I had to do some major ‘soul searching’, so to speak, on my writing. To be frank, i didn’t like what I was writing. It felt like – what’s the appropriated word? Cheap. I’ll go with cheap. And you guys/girls deserve better than that. I was going through my old works, and other previous Shannaro FanFic Writer (back when FanFics were a big thing in this site) and realized that I’m better than what I’ve been dishing out as of late. To quote one of the most honest people on this site: “Imagine if Kishi got us hooked on Naruto because its so cool (which he already has), then he took a 1 year hiatus…only to return with a beach volleyball chapter. Disappointment” I don’t want to be ‘that’ guy. With that said, here’s the latest chapter of Next Generation of Shinobi. Hope the old Zep comes out to play, and gives you something worthy of this site. Thank you, and I hope you enjoy. She looks out the window, as she does every night, hoping she’s safe. Wishing she was there by her side. Wanting to look at her eyes again. It’s been close to half a year since she’s seen her beautiful eyes. The cheerful glances they once produced, now filled with anger and sorrow. She wanted to stop the sadness, the darkness deep inside. She wanted to protect her the way a mother should protect her young. Show her the warmth of her love. Alas, she has to endure another day, another day without her beloved daughter, Yama. But all is not lost for Sakura Uchiha; she still has her other children with her this night. And on this night they were hungry. Sakura sat at the head of the table, observing her kids. Minku, the oldest of the Uchihas, was finishing up the last few bites of his dinner. “I heard you quit ANBU today, niisan. What, can’t take the heat?” The smirky remark belonged to Tenka, her youngest son. “Not quite.” came Minku’s reply after a short pause. “Then, why the resignation?” followed a genuine concern on behalf of Yoza, one of two sisters sharing Minku’s date of birth. “Just not for me. I figure I can use my time more productive doing other things.” “Like what? What’s more productive than protecting your village?” asked Ouka, the smallest in the family. “It’s not my village! Moving to Konoha doesn’t make it my village. My village, my home, is in Ueki!” “Calm down, Minku! She didn’t mean anything bad by it!” came Yoza to her sister’s defense. “That’s enough, you towards!” Sakura quickly ended the arguement before it started, giving Minku a dissiplinary look. The way Tenka sounded brought back memories to Sakura. Memories of Team 7, and their many adventures. Sasuke too thought of Naruto in the same light as Tenka did Rai. They were rivals to the better end. It also made her remember what it took Naruto to finally bring him back to her. He was a great friend, in every sense of the word. He never gave up on his promise to her. He went to great lengths to bring Sasuke to his senses, bring him out of the darkness. Made him remember how bonds don’t just bring weakness to someone, but love, warmth, and kindness as well. That in turn made her think of Yama, and how much she could be hurting right now. “Mom. Mom!” Yoza interrupted her thoughts. “Are you ok? You spaced out.” When she came to, she realized that Minku and Ouza had finished their food, and left the dinner table, but Yoza and Tenka were still there. “Sorry, I was… Nevermind.” She looked just like her sister, minus the discort in her eyes. “You mustn’t be like that, Tenka.” She continued her with their conversation. “Maybe you’ll be best of friends. Your father and the Hokage were in the same team, and they became closer than anyone would of thought.” “Yeah, I guess. May I be excused, Minku is going to teach me some new Shuriken Techniques.” Sakura nodded. Yoza took the oppurtunity of their solitude, “You were thinking of Yama weren’t you?” Sakura’s eyes showed the surprise of the forward statement. “My eyes see more than meer jutsus, mother.” joked Yoza. Sakura smile, “Yes. I can ‘see’ that.” she replied. “I just worry about her, that’s all.” “Don’t worry, father will bring her back. He promised.” Yes, yes he did. No one else knows better than him what she’s going through. If there’s anyone that can bring her back form the abyss is him. “Katon: Fireball Jutsu!” The enormous ball of fire came at him at an alarming rate. “She’s grown in strength.” he thought as he tried desperately to avoid the attack. The flame passed so close, he felt as if he was on fire. It was meer feet from him. “Fireball Explosion!” came the angry cry. “Nani?” he thought, as the fireball conbusted all around him, sendding him flying through trees, a rock stopping him from going any further. “She’s grown, in more ways than one.” he said spitting blood out in the process. “I have to stop her. I gave Sakura my word.” He regain his pompossure, and launched himself at the dark robed figure. “Chidori: Thousand Needles!” a volley of lighting pins left Sasuke’s fingers. “Oh, please. Don’t insult me with such plain techniques, father.” came Yama’s cold expression. An array of cherry blossoms took the place of her body. “Damn, a clone. Where did she go?” “Over here.” came the sound, followed by a combination of taijutsu. Sasuke held his ground with some taijutsu of his own. She jumped, and threw an array of shuriken at him. “Chidori: Nagashi!” She took the opportunity she gave herself. “Katon: Fire Canonball Jutsu.” This was Yama’s upgrade to it’s fireball cousin, only twice as fast, and more of a projectile. At this range, there was no way Sasuke could avoid the impact. Yama used the explosion to launch herself higher to the sky, making hand signs incase her annoying father survived the ordeal. He did. As the smoke and debri faded, she saw Sasuke surrounded by what looked like a skeleton engulfed by fire. “Ah. I didn’t want to have to use Susanoo, but I had no other choice.”Yama was suspisious on what that technique was. She never seen him do it before. And he never bothered to teach it to her. ” Damn old man has been holding out on me.” No matter her signs were complete. “Katon: Phoenix Rebirth Jutsu.” She placed her hands together, fingers spread, one thumb over the other, and blew throught the openning in the middle. 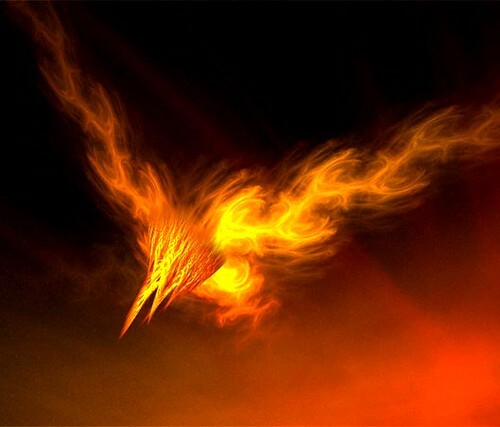 The flame soon formed into the shape of a large bird, and it took no time to dive straight onto Sasuke. Sasuke contemplated using Amateratsu, but couldn’t risk missing and hitting Yama. After all, he wanted to bring her back, not kill her – something new to Sasuke. He usually fought to finish his opponents, not just incapasate them. The large ‘Phoenix’ was approuching, he had no choice but to use Susanoo to seal the jutsu. But before he could do that, the bird changed course. Instead of hitting him directly, it crashed straight down. In an instant the forest was covered in flame. If that wasn’t bad enough, his Mangekyou was strainning him, he was feeling weak. But if he deactivated Susanoo, the flames would ingulf him. Worst yet, do to the flames around him, he couldn’t see a thing. He almost wished he could have his curse seal, so he can fly away from this. But that was from his past, and this is now. He had to think about now. ﻿”Katon: Fire Cannonball Jutsu!” Sasuke couldn’t pinpoint where the noise was coming from. And with fire all around, he could find the jutsu as well. It hit. This time the impact was greater, maybe because he wasn’t expecting it, or she just made it stronger, he couldn’t tell. But even with Susanoo, it hurt. This fight was was getting the best of him. He’s never fought for such a long time. What has it been, a week? Two? He couldn’t remember. It could of been a month, and it wouldn’t matter. What mattered was bringing his dauhgter back. This one took longer to hit, but it didn’t make it hurt any less. “She’s toying with me.” He remembered when he finally found her, how at first he tried talking to her. Talking the way Naruto did to him, when he was in the darkness. Seeing his past self in her eyes. He felt like such a hypocrite. She didn’t want to hear it. Hardly started a conversation, when she sprang to attack. It started with shuriken and kunais, and it led to this. He had to get out of here. He was lossing chakra, and his eyes weren’t helping the situation. He would use Amateratsu, and focus it on the fire, but again he couldn’t risk hitting her. She knew that. She knew he wouldn’t hurt her. She had the advantage. She had the luxury of trying to kill him, he did not. What can he do? He thought about the bond he had with Sakrua, with his kids. The bonds Naruto had with the whole village. He’s proving her right, right now. To her bonds are a reflection of weakness. To him they were to, at some point, but he knew better now. He would prove to her, and himself, just how strong those bonds could make someone. “Kirin!” She looked up into the air to see a beast of lightning going in and out of the clouds. She searched for her father, only to see him coming towards her at an alarming speed, Chidori at hand. Before she had time to think, the beast in the air came crashing towards her. “Forgive, Sakura. I couldn’t bring her back the way you wanted me too. She gave me no other choice.” The clash was so loud, it was heard for miles. And seen even farther still. By the end of the battle, the forest was in ruins. Trees were replaced with craters, those that were still standing were burnt to a crisp. There were no lakes, no rivers flowing, the water completely evaporated. All that remained were two motionless bodies on the floor, being showered by the rain that followed. “What was that?” Sakura jumped to her feet. “Looks like a thunderstorm is hitting the River Country.” Yoza expressed her thoughts. Sakura couldn’t help but think about both Sasuke and Yama, She really hoped they were alright, but she couldn’t shake this feeling. It was a bad feeling. Minku and Tenka walked back into the room. “What’s wrong, mother? Looks like you’ve seen a ghost.” – Minku.”Yeah, who died?” – Tenka.”Tenka, you musn’t joke like that!” – Yoza”Mommy, when is Daddy going to come back?” – Ouza”Soon, baby. Soon.” Sakura couldn’t help but look at the thuderclouds at the distance. i like your story so far. it has been a long time and i had to go back to ready the previous 3. the battle scenes were good and i like how your working the dynamics for naruto’s kids. would be nice if the chapters were a little longer. it seems like just when your getting into em you hit the end. all and all though a good read. @bringer: Thanks for reading the story (aparently only one who has.) I looked it over, and your right, it could be klonger. I’ll do a re-write once I have the time. I should explain the ‘incident’, and go more into the children themselves. Thanks for your comment. I read them all and generally try to respond with feedback. Even if sometimes i feel like im nitpicking. Though sometimes responding is delayed if i dont feel like posting from my phone. Instead of doing a re-write, I decided to explain the ‘incident’ and go more into the Uchiha children in the next installment (which I’m writing right now). It should be out in a couple of days.